"It was confirmed by the Decree N 950/2003 President of Ukraine from September 1st, 2003. The flag is a rectangular panel of white colour with a ratio of the parties 2:3. At the centre of a panel is the Ministry emblem. Height of emblem makes 2/3 heights of a panel, and width - 1/2 width of a panel. The wreath diameter makes 1/4 width of a panel. Both parties of a panel are identical." "It was confirmed by the Decree N 950/2003 President of Ukraine from September 1st, 2003. Gonfalone is the white square panel by the size 90X90 cm. with the mark of the Ministry of Ukraine of Emergencies and Affairs of Population Protection from Consequences of Chornobyl Catastrophe emblem. A panel on perimeter enframed by gold and ornamental pattern from oak and viburnum foliage. The free gonfalone ends are decorated by gold fringe. The contemporary side has no images. Flagstaff is black and wooden. 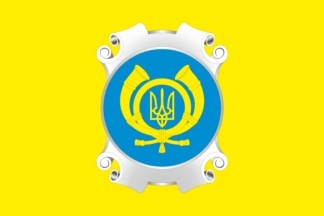 On the flagstass top is sagittate from yellow metal, at the centre of it is heraldry sign of the Ministry of Ukraine of Emergencies and Affairs of Population Protection from Consequences of Chornobyl Catastrophe. The top edge of a gonfalone is attached to pipe by cord". "It was confirmed by the Decree N 950/2003 President of Ukraine from September 1st, 2003. The arms is argent round board with or binding, on which background is gules paty cross with or borders. In the center of the cross is or fascia and round azure medallion bordered by or oak leaves, placed in the center of a cross. 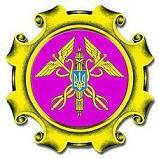 On a medallion is the element of the small State Emblem of Ukraine - or Tryzyb. On the sides of rhe cross are two azure triangular, between sides are gules fire with or borders". I visited Museum of Ukrainian Armed Forces in Kiev in January 2008 and took photos of flags and bought some Ukrainian flags books issued in 2007. This flag is the flag of the Ministry of Emergency (Extraordinary) Situations. The source is a photo taken by Nozomi Kariyasu. The resolution is low, so some details are missing. There should be a text on the orange ribbon, for example. The source is a photo taken by Nozomi Kariyasu. 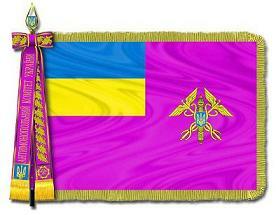 The flag and emblem of Anti-Monopoly Committee of Ukraine is at <www.amc.gov.ua>. These symbols were adopted by the decree of the President Kuchma, dated 10 July 2003. Flag of State Committee on State material reserve. Adopted: 9 December 2003. Flag of State Committee on Statistics,Ukraine: Blue-white emblem consists from 4 open books with greek letter "sigma" - international sign of summary and logo of statistics. Adopted: 20 March 2004. Ukrainian Antarctic Station (former permanent Faraday British Station) Akademik Vernadsky. Organizing authority: Ukrainian Antarctic Centre. I was told that only Ukrainian national flag flies there. The logos are displayed on buildings and on shoulders of the jackets of the crew. Images by courtesy of Mr. Gennadi Milinevsky, Ukrainian Antarctic Centre, Kiev.